This embroidered work is called takaghaghquq. This is one of the ways a man’s formal boot would be made. These soles are old; nateghqaq we call them. Somebody, a little girl, let this little doll walk and walk. He’s like a real person, and he wore out the soles. The body is made out of driftwood and the head is bark. 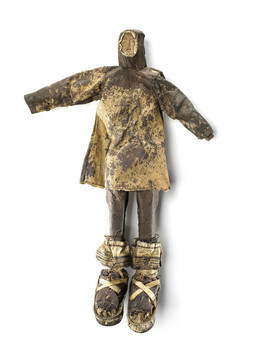 This girl’s play doll has a hooded parka, pants, and boots, all sewn from shaved seal skin. The oversized boots are embellished at the top with red thread to represent the takaghaghquq designs (patchworks of red and white skin strips) that were applied to Yupik footwear. Elaine Kingeekuk explained that the doll’s boots needed to be extra large in order to show details of these designs, which signify age, gender, and clan. The interior wooden armature of this toy was jointed to allow a child to make it walk and to bend at the waist and arms.